This week is all about sharing those ulitmate compliments when a quilt is transformed into that perfect quilty hug like Jasmine who blogs at Quilt Kisses always seems to do so well! I had to skim a bit, but I found one of my favorite older posts of hers titled: Three Small Quilts. If you haven't stopped by her blog...do! 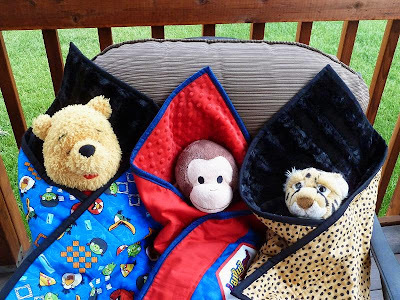 Her boys are adorable and they truly enjoy every lap quilt she creates for them! There is nothing better than seeing a quilt you have made being loved and used! I think that seeing them wearing out tells me it is used and loved. Waiting to get a call for a new personal quilt. Oh, cute! Your grand son looks perfectly comfortable in his quilt! What a cutie. Special memories in the making. I have already shared this quilt before but I really love the pattern. Great picture Val; great quilts all! You are so sweet, Val! My loved ones all make quilting worthwhile. Although my favorite story came from my brother. He told me that he loves using the quilt I made for him, but his wife keeps taking it away to hang on the wall! Lol. A wall hanging for my sister-in-law is on my to-do list. Your grandson is sure adorable in his quilty hug. Well if that isn't a photo of cozy happiness, then I don't know what is. So adorable Val! Thanks guys! Your comments and support always makes my day!! What a thoughtful SIL you have.... and such a cute grandboy! Is there anything better than making a quilt for someone and then seeing them enjoy it? I think not! Your little puddin' looks so comfy all wrapped up in his quilt! And you are right about Jasmine's lads; they are adorable! That photo is so sweet!! The ultimate thank you is to see someone cuddled up with a quilt you made. That's a such a cute photo of your little guy and his dad. Flowered Quilting & A "Treat"